The final round of day 2, and I was tired, hungry, and surprised to be undefeated at this point. There were five other undefeateds left, and I didn't really want to play into any of them in that condition. 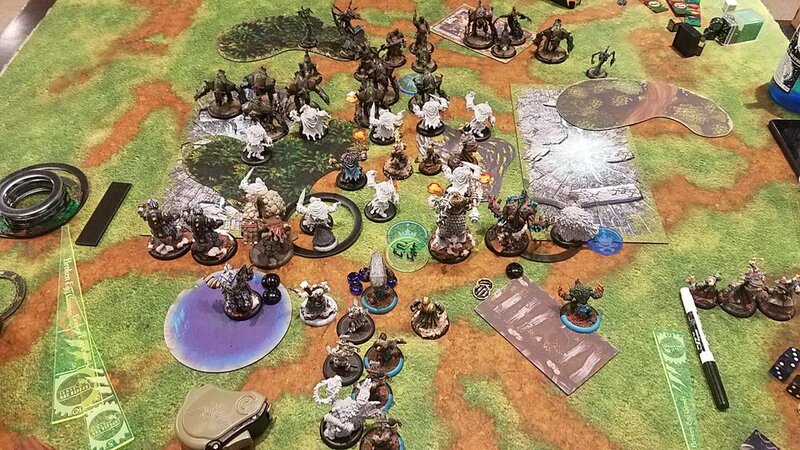 Cory was still in with Magnus 2/Ossrum, Greg had Nemo 3 and something else, Andrew had Ghost Fleet and Skarre 3, Pyne had Asphyxious 3 and something else, and there was another player who I didn't have the name for who had Harkevich double Victor. I ended up paired with Pyne, who had, as mentioned, Asphyxious 3 and something else, and he'd played Asphyxious 3 all day. Furthermore, we were playing on Recon II, so I figured that he'd be playing him into me. I've thought about this matchup an awful lot, and I knew that Borka 2 was the correct drop here, so I played Borka and he played Asphyxious. I, very sadly, lost the roll off. You know what's awesome about this list? It gets +2 inches of deployment, and then runs 16 inches. Everything ran, Asphyxious put up Ashen Veil on a random Slayer. I'm already in Assault range from Fire Eaters, so I throw them at two Slayers and do a LOT of damage and light them on fire. I run my Raiders up and Screen them, and Borka walks up and pops his feat. I put Valka on the flag. The power of Borka's feat is on display here, as usually the Slayer list will trivially clear the screening infantry and then send back Slayers into the inner lines. With auto-stationary, this isn't really possible, and Pyne is only willing to let one Slayer get stationary. He kills two Raiders with Nightwretches, and spends a lot of time making sure I can't ambush into anything on my left hand side. He passes the turn, not contesting my flag with anything. I lose a Fire Eater to a fire check, and ambush Bears on the right. I get two full Bear charges into the Slayer on the right under stone, and spectacularly whiff, missing the first charge attack. More Fire Eater assaults clear out a Nightwretch and basically kill another. I also manage to kill off two of the Iron Mongers (yess) and do 11 damage to the objective. Bears on the left walk up and cuddle another Slayer, and I'm forced to go kill it with my Earthborn. Lanyssa moves up and uses Winter Storm to get rid of Pathfinder within 9 inches of herself. I score one and I've contested his flag with a Bear so he scores none. Pyne takes a look at the board and just starts killing trolls. I lose a bunch of Raiders, all but two Fire Eaters, and a Bear from each unit. The Earthborn gets left on about ten boxes, and he contests my flag with a Machine Wraith outside of the zone. He has successfully cleared off his flag, so he gets to score this turn and I do not. Something to note - Asphyxious is just getting an absurd amount of souls this game. Vociferen and the Soul Trapper bringing him souls every turn is really strong and something I hadn't thought about in this matchup. It's a bit of an awkward turn for me here, but I finally start killing Slayers dead. 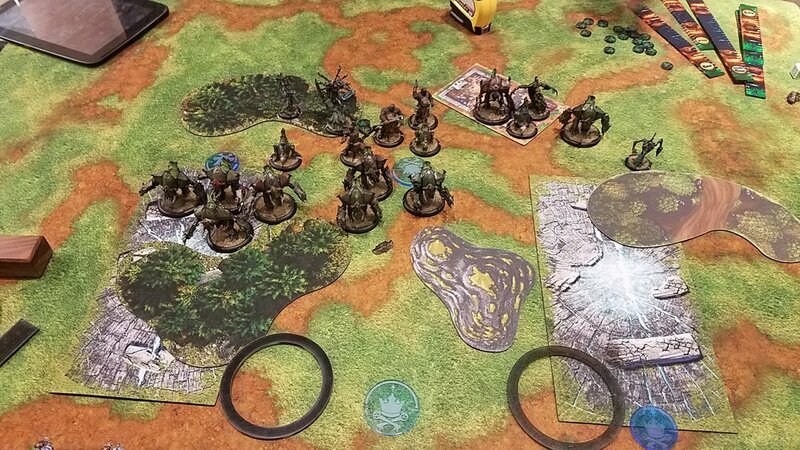 The remaining Bear on the right combined with his Handler kill off the Slayer that they originally attacked. Fire Eaters do some damage to the Slayer there, and I decide, after the Runebearer doesn't kill the Machine Wraith with a spray, to charge it with Valka. He leaves it on two boxes after some pretty sad damage rolls. Fortunately, the movement is now out, so my Pyre Troll moves up and blasts the Slayer off the table, splashing blast damage onto the Fire Eaters and doing nothing. 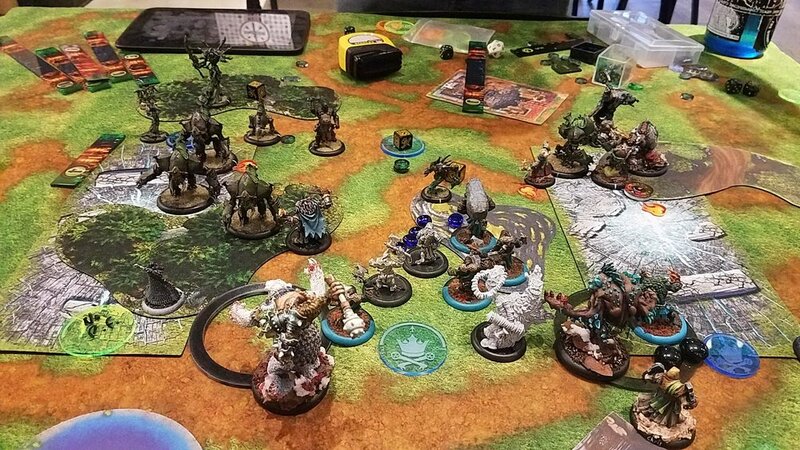 On the left, my Bear unit half kills a hurt Slayer, which my Earthborn finishes off and then whacks the other Slayer on him down to about 1/3 health. 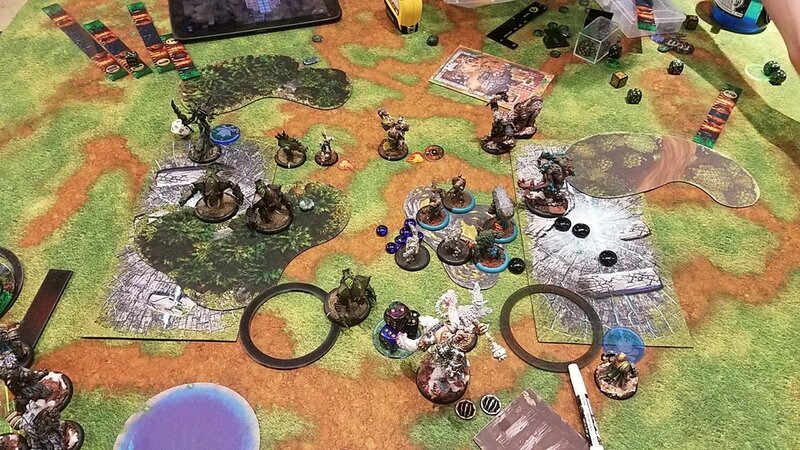 The Fell Caller goes nuts and finishes off that Slayer so Borka doesn't have to, and suddenly the Slayers are down to four and two of them are a bit hurt already. I score my zone and Pyne doesn't score since I contested his flag. Curse you Machine Wraith! Valka, now that he's exposed, gets charged and murdered by the central Slayer. I lose the left unit of Bears entirely and all but one Raider. The Fell Caller also dies, but he can't get to Lanyssa thanks to Winter Storm and she contests the zone for me like a champ. Pyne scores one and I score none because, once again, my zone has a Slayer in it. 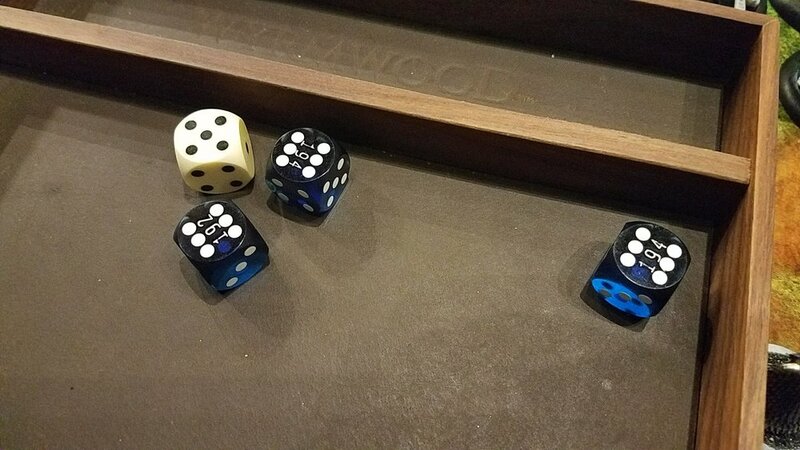 I get some typical Bear dice here and the unit on the right bounces off the Slayer. I do have range to him with my Mauler though, so I move the Pyre up and kill the objective, and then get the Slayer with my Mauler. 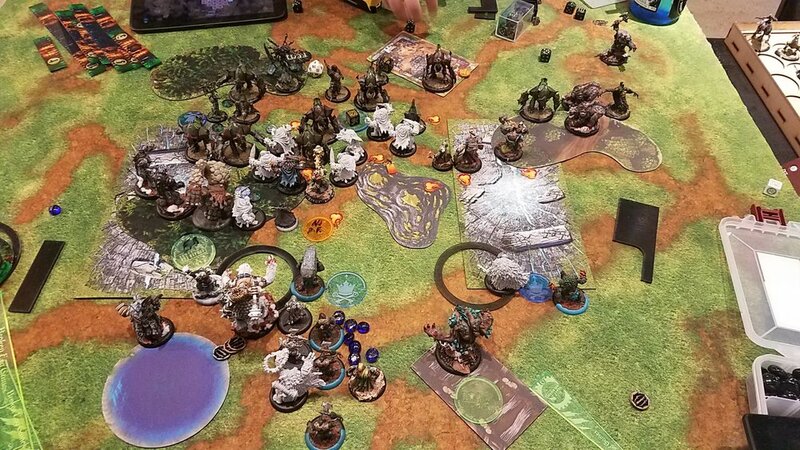 Borka moves over after the Runebearer fails to kill the Machine Wraith again, and uses his spray to take it off the table. I am able to get a bead on Vociferen with my Fire Eaters, but they leave him on a box after also lighting the Nightwretch on fire and killing the cortex. I Lanyssa to contest his flag and zone, and she also ice bolts Vociferon to death. I also move my last Raider into a the foremost Slayers way and smash him for a couple of points. I have scored three at the end of this turn, and the game definitely feels in my favor. Pyne looks at the table and decides he needs to get our scores back to parity if he can. All his Slayers get fully loaded, and he debates taking a free strike from the Raider to go after my objective. "You never know man" I say jokingly, "he could roll triple sixes and take out your cortex or something." "Enh, I'll take my chances." Bye bye to both of the Slayers arms! Yeah that Raider already has a pretty good paint job, he's getting a MUCH nicer one sometime soon here. With both arms out, the Slayer bounces off the objective for something like 2 points across his attacks. His other Slayer has already gone and killed Lanyssa, and he has to decide if he's going to score his zone or prevent me from scoring with his other Slayer, who would eat a bunch of free strikes and die to the Mauler next turn. He takes revenge on the hero Raider, we both score two, and he passes his clock. Borka pops the Pyre animus for free and kills the Slayer by the objective. Fire Eaters assault to contest both the flag and Pyne's zone, and I score two more points to win by five. I've put a lot of thought into this matchup, and I'm glad to see it paid off. The Earthborn did his job, which was to kill 2.5 Slayers before he died, which was largely possible because of Lanyssa's Winter Winds keeping them slow. The Fire Eaters tore apart the Nightwretches and Ironmongers while also putting some decent damage into Slayers and lighting them on fire, and my Raiders screened perfectly on feat turn. Pyne was another fantastic opponent (and Patreon supporter of Line of Sight, so I might be painting a model for him at some point!) and there were a lot of laughs during our game. With that, I had qualified for day 2 in first place out of the four remaining players, and it was time to get myself some dinner!